The patient is placed in a supine postion with the Therapist supporting the patient's head with the palms and 3rd-5th fingers. The Therapist then places the index fingers between the occiput and spinous process of C2, so the index fingers are over the neural arch of the C1 vetebra. The Therapist then lifts the patients head and C1 vetebra anteriorly, without allowing flexion or extension. The position should be held for 10-20 seconds. Pettman E: Stress tests of the craniovertebral joints. In: Boyling, JD, Palastanga N, eds. 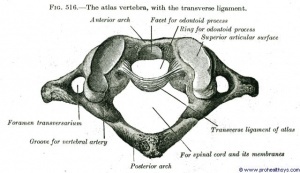 Grieve's Modern Manual Therapy: The Vertebral Column, 2nd edn. Edinburgh: Churchill Lingstone, 1994:529-538. Tensile testing of the mechanical behavior of the human periodontal ligament. ↑ ↑ Dutton, M. (2008). Orthopaedic: Examination, evaluation, and intervention (2nd ed.). New York: The McGraw-Hill Companies, Inc.